A question often asked by our guests at St Vincent's is “why is the town hall SO big?”. Excellent poi nt. 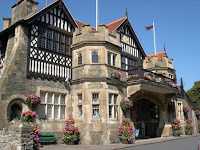 George Newnes, one of the architects of making Lynton and Lynmouth the tourist haven of North Devon in Victorian times, was a successful publisher whose claim to fame was primarily for getting Arthur Conan Doyle’s works out to the public via his monthly illustrated periodical The Strand. He came to the area following the request from a friend and entrepreneur Thomas Hewitt who wanted some investment in the area, which Newnes gladly gave. For some time, there had been complaints that the town lacked the quality of public building needed to hold meetings, and it was decided by the villagers to erect a proper town hall as a way to celebrate Queen Victoria’s Diamond Jubilee. This proved to be far too ambitious financially, until George Newnes stepped in with the cash to build such a fine monument to the Queen. The Town Hall took two years to build and cost the princely sum of £20,000 and on 15th August 1900, George Newnes officially opened the building, an unusual grand mixture of mock-Gothic, neo-Tudor and art nouveau design. It still holds a prominent position in the town and hosts town council meetings, line dancing and jive classes, a second hand bookshop and weddings (more details here), to name just a few. When we first moved to North Devon to take on the B&B, one of the first things we noticed was how dark it was at night. Strange, but true, and looking back, this was a bit of a daft thing to comment on as Exmoor (we have since found out) was the first dark sky reserve in Europe. On a clear night, the views are quite spectacular and people come for miles to experience the beauty and tranquillity of Exmoor. You can even see the glow of the Milky Way on dark moonless nights. This morning on BBC Radio Devon, hub of local news and info (really), Exmoor was mentioned a couple of times, and a star in the making, Brian from Bideford, was featured. Tune in to listen to this local gem at around 2’ 45’ 35’ in. Classic local radio! 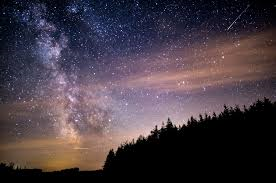 For more info on the dark skies in Exmoor, look at the Go Star Gazing and Exmoor National Park websites, and to hire a telescope, visit the Exmoor National Park Centre in Lynmouth. Happy stargazing! 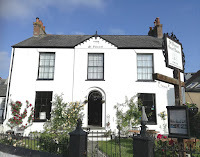 If you want to experience the beauty of the dark skies in Exmoor, stay with us at St Vincent Guest House in Lynton. We can even point out the odd star cluster and moon these days. Refill Your Water Bottles Here! “Every minute, one million plastic bottles are bought around the world, and that figure is expected to go up 20% by 2021. In the UK alone, we consume 13 billion plastic bottles a year – 7.7 billion of them are plastic water bottles, despite us having some of the best quality drinking water in the world.” Refill.org . When we moved to St Vincent’s in Lynton in 2016, we were amazed at the beauty of the place and how unspoiled it all was. Until it came to recycling day. As newbie B&B owners, we were staggered at the amount of waste we were generating and although we recycled everything we could, quickly were shamed into making the decision to stop some of the recycling at source by no longer providing toiletries in disposable plastic packaging and bottled water. It was a start. 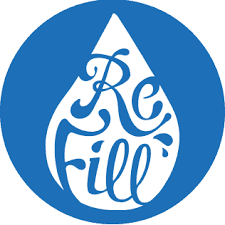 We heard about a new organisation called Refill.org who actively encourages bed and breakfasts, hotels and restaurants to provide water free of charge to anyone who is passing. We duly signed up and you can find us on the Refill.org app. So, if you are passing and are thirsty, knock on our door and we will happily refill your containers! Life is full of wonderful surprises, and here is a fine example. 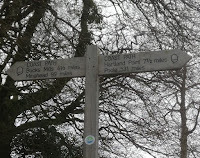 One of our lovely guests arrived at St Vincent’s B&B and said that on her way from Porlock to Lynmouth along the South West Coast Path, she stopped short and saw a box with all sorts of refreshments, flasks and cups with a note saying: “Walkers Honesty Café. Please give what you can.” We posted the pictures on Facebook and quickly discovered that the lovely couple who do this philanthro pic gift are the Gurneys. Julian Gurney wrote on our page “Glad you like it. Mrs Gurney puts it out, proceeds go to feeding the woodland birds”. Thank you indeed! Don't forget to be pleasantly surprised when you walk along that stretch of the path, leave a note and a donation. For best rates at St Vincent Guest House, Lynton, book here! 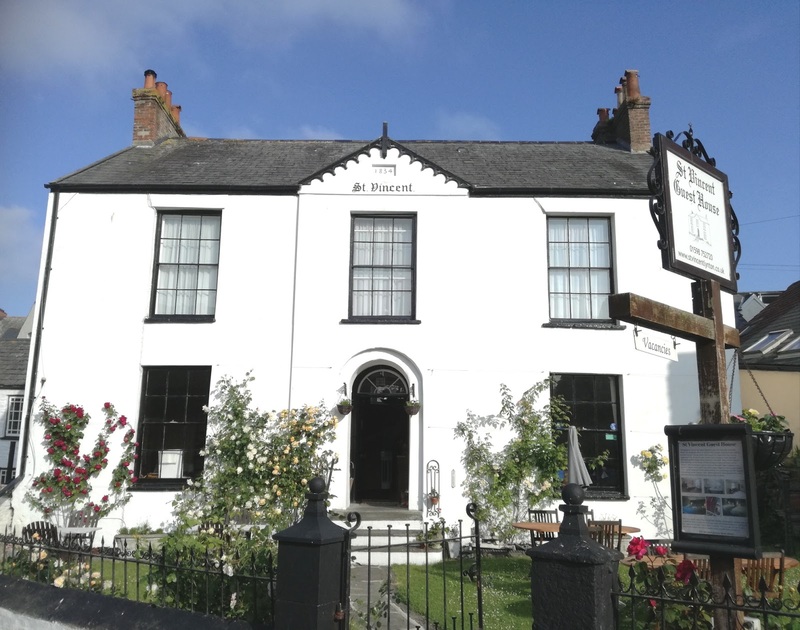 St Vincent’s B&B is just two minutes away from the Lynton stretch of the coast path (assuming you dedicated aficianados have already climbed up Lynmouth Hill to reach us or taken the Cliff Railway and can begin the walk from the top). 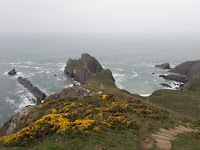 The South West Coast Path, all 630 miles of it, was originally created by coastguards patrolling the south west peninsula looking out for smugglers (think Poldark, Whisky Galore). There being not quite so many smugglers today, the cliff top walk now forms the beautiful coast path and has some of the most incredible and memorable views in Britain. 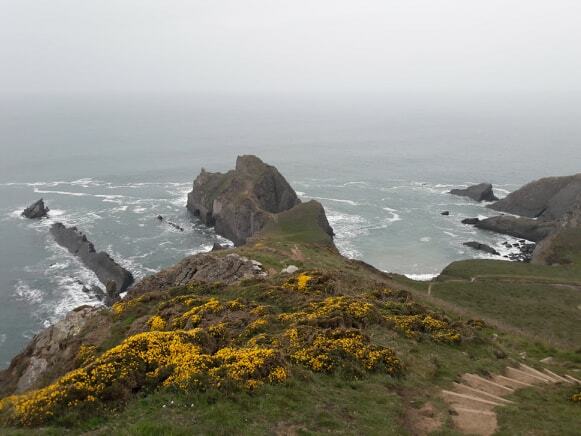 Since living in North Devon, the fitter member of the St Vincent team, Mike, has started to undertake the walk from Minehead to Poole Harbour, with almost all of Devon ticked off now before moving on to Cornwall. Today’s trip from Hartland Quay to Clovelly is described as "challenging". Perhaps one of the biggest challenges, however, is the realisation that the distances given between each point have been woefully underestimated. So, we are thinking 630 miles might be nearer 700 (also taking into account getting lost)! Watch this space. Love them, or hate them, the goats are a part of life in this corner of North Devon. You only have to listen to the first few seconds of Mark Steel’s in Lynton and Lynmouth recorded a couple of years ago at the town hall to hear how divisive the little horned devils are. Nestled in Valley of Rocks, they are sometimes visible, sometimes not. We often mention to guests not to miss out on that beautiful stretch of coastline and to see the goats. Often, they come back and say, where are the goats then? Stealth, despite other obvious traces. They have been integral here for well over one hundred years and were allegedly brought in to manage the greenery and gorse over Valley of Rocks, but they have been known in days gone by to come into Lynton and raid allotments and gardens. 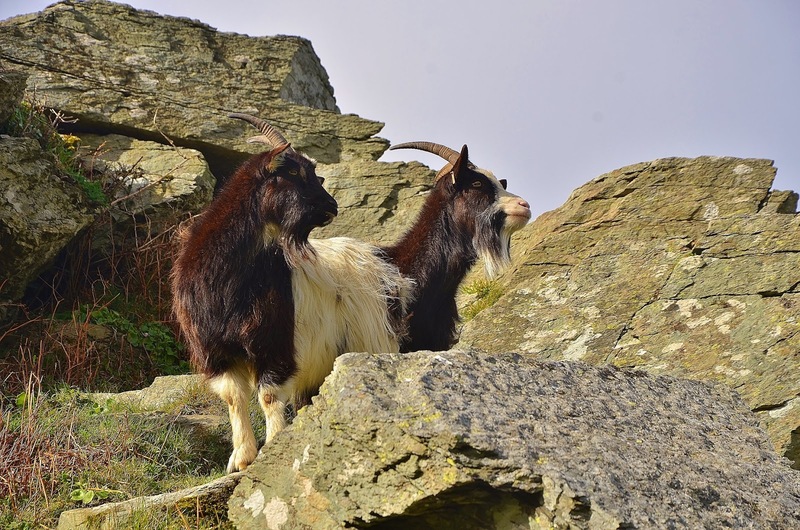 So famous are they have appeared in the Guardian “Don’t talk about the goat wars: how a feral herd divided a Devon village” and they have their own Facebook page. Not quite “goat of the day”, but photos of them are frequently snapped and shared. 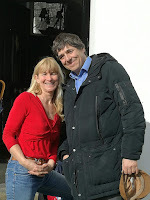 Anyway, if you are not a fan of goats and would like a laugh, listen to the recording of life in Lynton and Lynmouth by Mark Steel. What a funny man. And (not name dropping, of course) he stayed with us 😊. When we first saw St Vincent’s in 2015, we knew it must be a very special building, just by looking at its beauty and uniqueness of architecture. 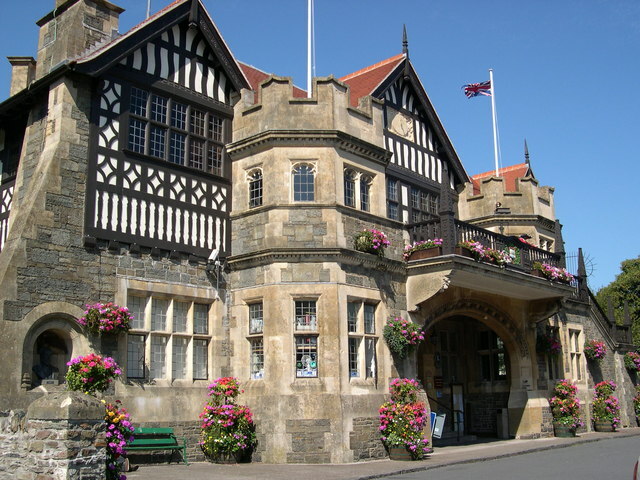 It is the only detached late Georgian building in the twin towns of Lynton and Lynmouth and was constructed at a time when there was a growth in building in what is now referred to as the old part of Lynton in the early to mid-1800s. 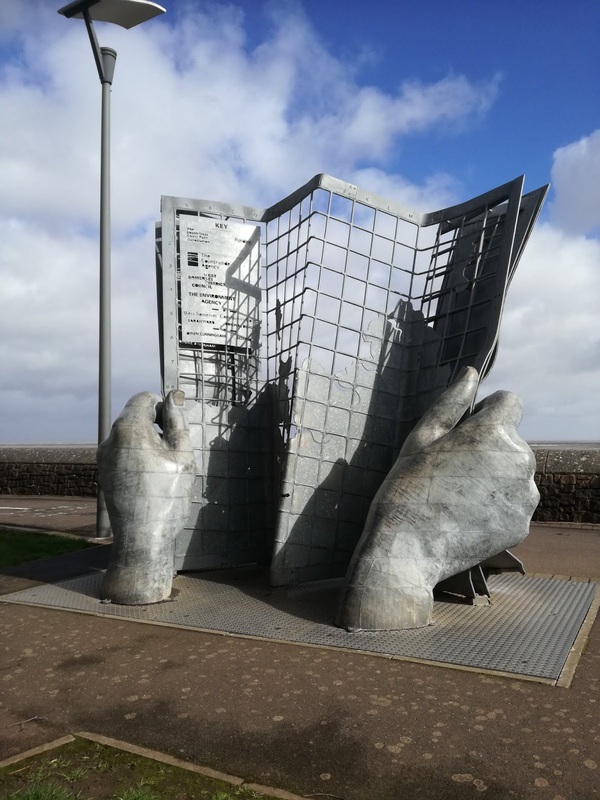 We decided we would like to look into the rich history of our home, and are gradually learning more thanks to archives, the internet and talking to people with links to the place. Completed in 1834 in the oldest part of Lynton, this beautiful Georgian house was originally called St Vincent Villa and was a modest family home, built by master mariner Thomas Geen who named the house after his ship (see drawing below). Many of the original characteristics are still present including the central feature of the house – the impressive regency staircase, beautiful open fireplaces, the servants’ garret rooms at the top of the house, flagstone and wooden floors, meat hooks hanging from the pantry ceiling, the outbuildings and the original iron railings at the front and back, which seemed to have escaped the call in the First and Second World Wars for iron for munitions. © 2019 Emma Anderson/St Vincent Guest House, Lynton . Simple theme. Powered by Blogger.